Director Ridham Janve’s debut feature, ‘The Gold Laden Sheep and the Sacred Mountain’ has the distinction of competing at the 49th Rotterdam International Film Festival, held January 23 to February 3, 2019. This remarkable film works as a universal, timeless morality play on how age-old wisdom and an inbred honesty can falter when wealth glows at a distance. The film is set in the scraggly, deserted Dhauladhar mountain region in northern Himalaya, whose inhabitants take days to meet, due to its winding, lonely paths. One sees vast expanses of varied landscapes - imposing, larger than life, impressive as well as perilous - with herds of cattle, or a dog, or just a lone figure, which appear as distant dots on unending mountain ways. The locals are known as Gaddi, which is also the language they speak. In this deserted space, a group of men get together for a round of chatter and gossip. 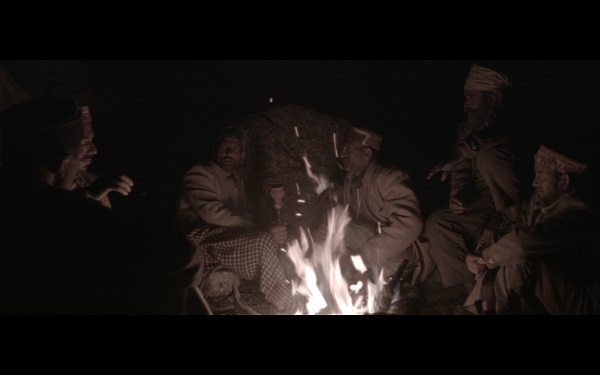 They talk of a day in the year 2012, when while tending to their sheep and goats, an elderly shepherd Arjun (played by Bhedpal Arjun Pant) and his servant (Lokendra Gurung) heard a fighter jet crash in a distant valley. The servant hopes to make a load of money through scavenging the jet’s wreckage, but the shepherd insists they continue their journey as planned. When they emerge on the other side of the Indrahar Pass, they discover that despite the search by air-force helicopters and local rescue teams, neither pilot nor wreckage could be found. Arjun then gets convinced that the crash occurred near the “Sacred Mountain”, where, according to legend, a well-to-do and arrogant herdsman had disappeared. When the servant learns of the sizeable reward being offered to find the wreckage alongside its suspected hoard of gold, he goes in search for both. His journey turns hazardous as he gets pinned down in the thick foliage, while the shepherd’s unguarded livestock wander away to be prey to forest predators. Because they covet more than their due, their recurring fear is incurring the wrath of their Serpent God. Perhaps, too late for the realization that life is more precious than gold. ‘The Gold Laden Sheep’ looks ethnographically at space with the humans who inhabit it, and how both shape and influence each other. Its story moves languidly and gains impact, as its visual, elemental power presides over mankind’s destiny. The dialogue is sparse, marked by an unusual guttural thrust, crusty humour and an occasional crassness. Janve cast members of the Gaddi community who had never acted before a camera. Many of them doubled up as camera and sound assistants. Only the cinematographer and sound recorder came from Mumbai. To quote Janve: "My film is more than just a rare language film. It is an ethnographic film where the essence of the story needs to be kept intact while making it. That is one of the reasons why as a filmmaker I did not cast any actors, but local people." He adds: “The sacred mountain in many cultures is portrayed as a symbol of the earth, spirituality and eternity … For the Gaddi community of the Dhauladhar range; it represents the unexplained balancing force of the universe, which could bless you or destroy you.” Produced and co-written by Akshay Singh and Janve for their banner Dark Matter Pictures, the music is by Jered Sorkin, cinematography by Saurabh Monga, and editing by Kratika Adhikari. Born in 1986 in Ajmer, Rajasthan, Janve grew up in Udaipur. A graduate in Communication Design from the National Institute of Design, Ahmedabad, he previously directed the short ‘Kanche aur Postcard’ (2013), an official selection at the 44th International Film Festival of India. It also represented India at the SAARC Film Festival 2015 in Colombo. ‘The Gold Laden Sheep’ shared the Silver Gateway award, with the film ‘Jonaki’, at the 2018 Jio MAMI Mumbai Film Festival with Star. It also won the Prasad Digital Intermediate Award at the 10th NFDC Film Bazaar in Goa. Now, it embarks on its international run, vying for awards and acclaim at the highly regarded Rotterdam International Festival, known for its high standards of regarding cinema primarily as an art form even as it aims to win over wider audiences.